Kerry deserves a pat on the back for fantastic effort to raise money for charity. 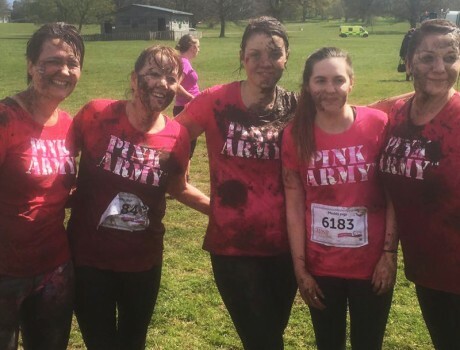 This weekend, Kerry Dudley with four friends competed in a Race For Life Pretty Muddy at Weston Park in aid of Cancer Research UK. Running for a total of 5K Kerry battled the cold, mud pools and obstacles to finish successfully in a time of 48 minutes. In celebrating her effort Kerry remarked it was well worth the cold, mud, hail and rain to raise, as a group, £1,000 for cancer research to help towards hopefully finding a cure for this horrible disease.